In my opinion, beautiful food speaks for itself – and this dish is an example of just that. No frills but it sure looks fancy! I explored my true love for lentils several months ago when I made my lentil “bread” and consumed more lentils in two months that I had over my entire lifetime. 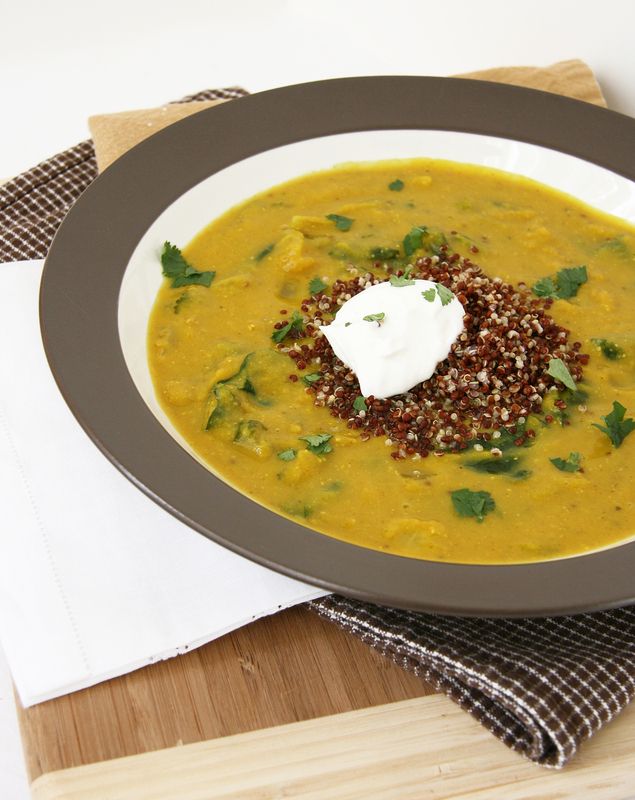 I’ve made a few dishes since with lentils or served them as a side dish but it was time that they were star of the show again – enter Lemon Lentil Soup. 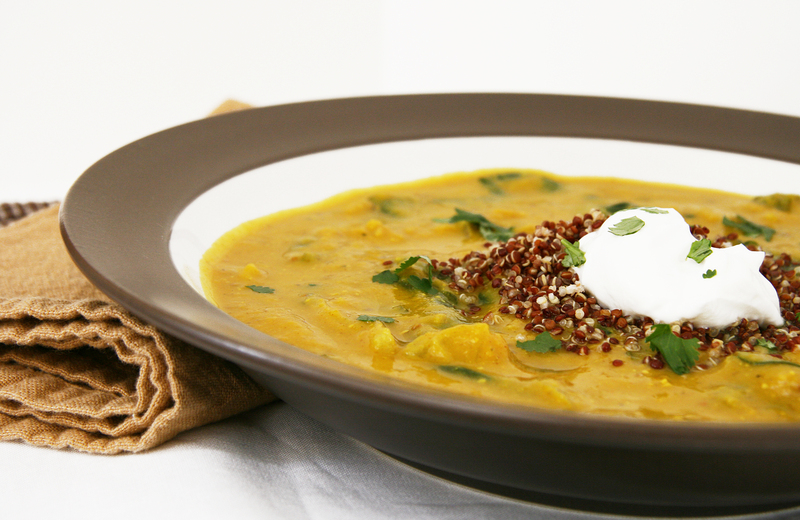 This comforting soup is lightly adapted from 101 Cookbook’s Red Lentil Soup with Lemon. If you are a fan of lentils, this is a must-make recipe. This comforting vegan soup is brilliantly colored from ground turmeric, has lovely texture and flavor from sauteed onions, spinach and brown mustard seeds and is finished with plenty of fresh lemon juice for brightness and tang. Instead of brown rice in the original recipe, I served mine with nutty red quinoa and topped with a dollop of creamy plain Greek yogurt. I skipped a step or two and didn’t saute the spinach separately but added the greens along with the cooked onion and allowed them to wilt and maintain a nice texture. I subbed brown mustard seeds for the yellow that were originally called for and used coconut oil instead of butter…though I am sure butter/earth balance would add a rich flavor to the base. While completely optional, I added a jalapeno for a bit of heat and several tablespoons of chopped walnuts for a bit of crunch and enjoyed both additions! 1. Put the lentils in a pot with 7 cups / 1.6 l water, the turmeric, 1 tablespoon of the oil, and 2 teaspoons salt. Bring to a boil, then lower the heat and simmer, covered, until the lentils are soft and falling apart – twenty minutes or so. Puree with a hand blender. Add more water until the soup is the consistency you like, then taste and add more salt if needed (soup will thicken upon cooling). Keep the soup warm/hot. 2. While the lentils are cooking, prepare the onion. In a skillet over low heat cook the onion and jalapeno (if using) in 2 tablespoons of the remaining oil along with the cumin and mustard seeds, stirring occasionally. When the onions have softened, roughly 10 or 15 minutes, add the cilantro and cook for a few seconds before removing from the heat. 3. Add the onion mixture to the soup, then add the juice of the lemons, one lemon at a time – until the soup has a nice bit of tang. Add spinach to the soup, stir and let wilt. Season with more salt and black pepper to taste and stir in chopped walnuts or pine nuts if desired. 4. 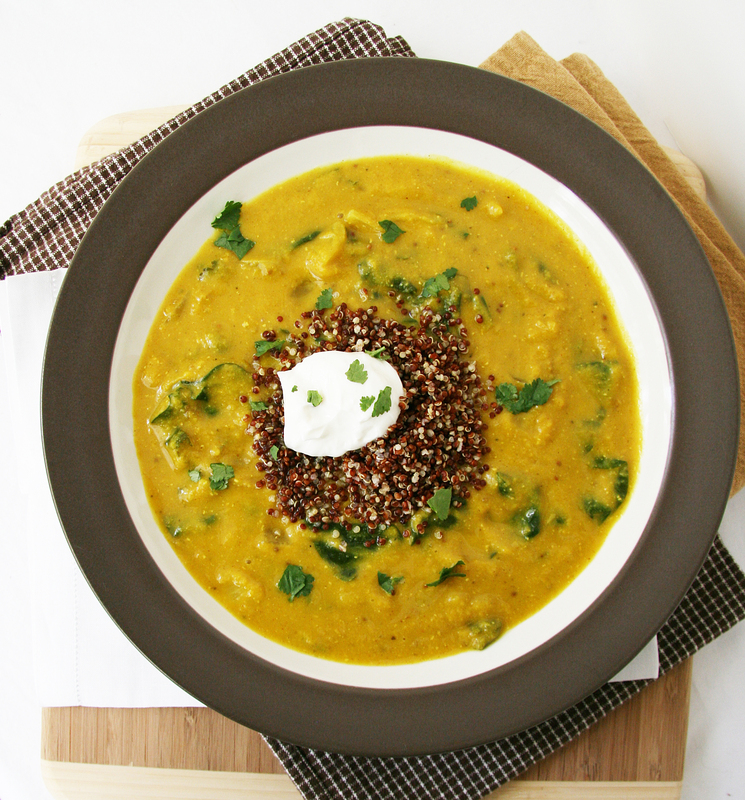 To serve, place a scoop of quinoa in each bowl, then ladle soup, a dollop of yogurt and fresh cilantro. Enjoy! Serves 6. *Leftovers freeze well; if freezing, leave yogurt out and add when serving. I love when you copy me 🙂 that’s a big compliment! I hope you like it, let me know how it goes! It really is a lovely combo of flavors 🙂 I think some of this hearty soup might just perk you up! Winter nights are tough for me too, I miss the sunshine! I am so happy you found me too! 🙂 Thanks for saying hello! You are exactly right – this soup is delicious, comforting and refreshing! I had bought some key limes and you know how you have to buy a whole bag of them instead of just how many you actually need. I used about 9 of them instead of the lemons and it gave the soup a nice, “sweet” tanginess. Nice thinking on the fly B! I can imagine that key limes would be really interesting and add a different dimension to the soup! I’ll have to give that a try…well, if I can get a bag of key limes up in MT that is! 🙂 Thanks for the feedback! Wow am I ever behind in my reads… hadn’t even seen that one yet! That soup looks really good, Nora. I am really intrigued by the addition of lemon. Do you think it would canibalize it beyond recognition if I was to leave the turmeric, cumin and cilantro out? I realize that I wouldn’t be looking at the same culinary experience at all… but do you think that it would still taste good? 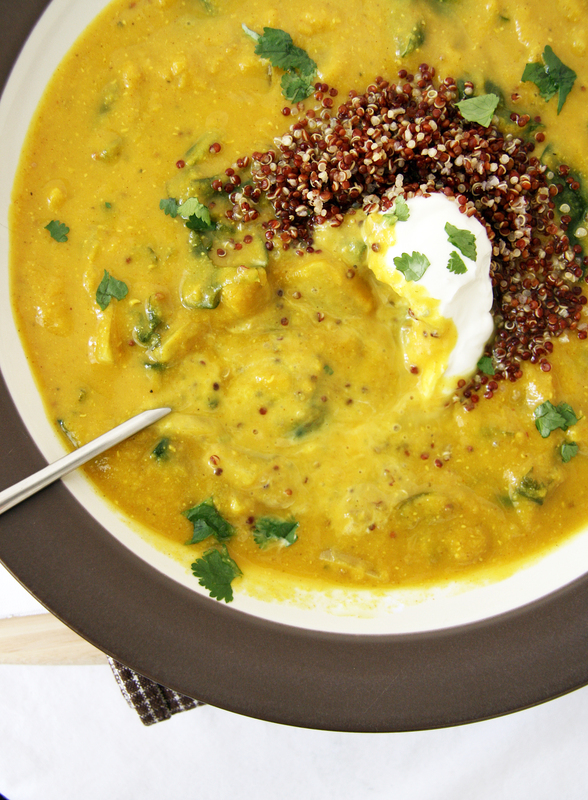 The lemon is what makes this soup – I think you could leave out the turmeric and replace the cumin with another spice…I’d replace the cilantro with another fresh herb to really brighten up the flavors. It would be different but I bet you could make something that tastes AWESOME without the three 🙂 You have a knack for seasoning and flavors! Alright then! I really like the idea of lemon and lentil together in a soup. I will definitely have to give it a try. Currently making this for dinner tonight! I didn’t have any lentils in the house!! I so thought I did 😦 Saving it for this week… Will let you know. This recipe is AWESOME. I followed it exactly except I didn’t have mustard seed so I just used spicy mustard instead. I added a little lemon pepper at the end and oh my! Delicious!!! Thanks for the great recipe!! I am thrilled that you enjoyed this as much as I did! 🙂 Lemon pepper sounds delish!